Learn more about our energy management system project with Media Corp Singapore. Energy Quality Solutions That Brings Peace Of Mind. To reduce cost, improve quality, enhance reliability. We specialise in condition monitoring solutions. 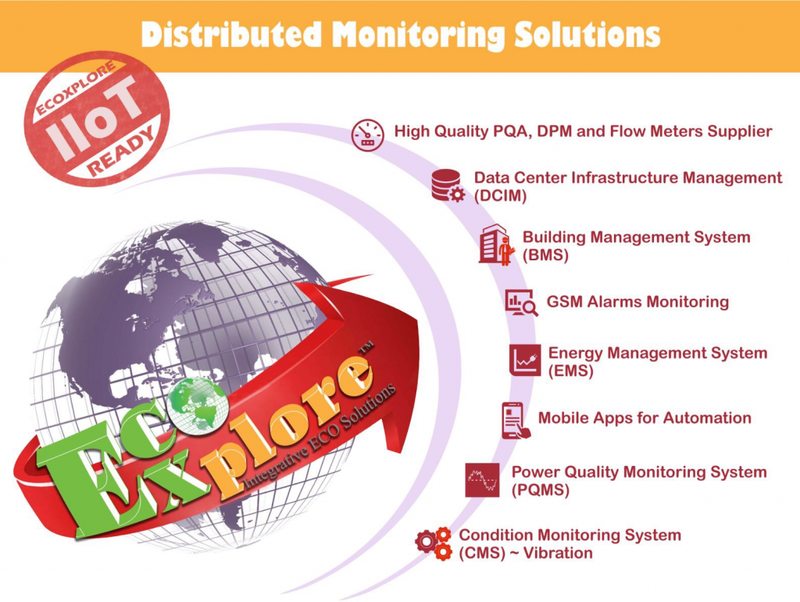 EcoXplore provides technology to allow you to do remote metering of Water, Air, Gas, Electricity and Steam. EcoXplore is a homegrown Singaporean company, specializing in energy monitoring & smart internet of things (IoT) solutions. We provide a wide range of solutions that can be applied in industries such as water, waste-water, power, environmental, food and beverage as well as process. We offer high quality digital metering, relaying and networking instruments as well as intelligent, integrated automation systems that cater to different industries and applications. Besides this, EcoXplore concurrently provides analytical solutions to its clients. Our market products and services consist of data logging and analytics, maintenance services, energy monitoring system and alert monitoring solutions. We are a quality guaranteed company with certifications such as OHSAS 18001: 2007, ISO 9001:2015, BizSAFE Star and Culture Safe. Our customers trust us to create energy conserving and environmentally friendly power system solutions that are safer, more secure and reliable. Our solutions allow you to use energy conserving and environmentally friendly power system solutions that are safer, more secure and reliable. It will help you to increase energy efficiency, fully utilize existing assets as well as cut emissions without compromising output or product quality. Increase the performance and operating life of your critical machinery and machine components through optimal condition monitoring. You can identify potential machine faults early, plan preventive maintenance effectively and prevent unnecessary machine downtime, whilst keeping your costs under control. Our product portfolio covers all important aspects of a fully optimized Energy Management Solution. These can range from meters and communication devices to an energy management software platform that seamlessly integrates with your existing energy meters. We want to be your trusted energy partner. With decades of expertise in electrical system management, technology manufacturing and hardware/software integration, we deliver solutions tailored to your specific needs. These solutions enable you to track energy usage, monitor internal power conditions and make timely cost effective decisions. CET Singapore is committed to providing optimal products to meet our client’s energy metering, monitoring and reporting requirements. CET Singapore brings together quality products and support to cultivate quality solutions. A global leader in the design and manufacture of easy-to-install, ultra-precise electric power instruments for monitoring power quality and energy, and performing data analysis. Independent from machine manufacturers and suppliers of process control systems, they enable us to develop tailored solutions to satisfy our customers’ interests. A leading IoT technology and solution provider with complete end-to-end IoT solutions to industrial customers. Its network has become the biggest low power (LPWAN) in license-free band in China. EcoXplore provides innovative and cost effective energy products and solutions to meet our client needs. Our commitment to quality delivery is essential in helping us establish mutual trust and long lasting relationships with our customers.